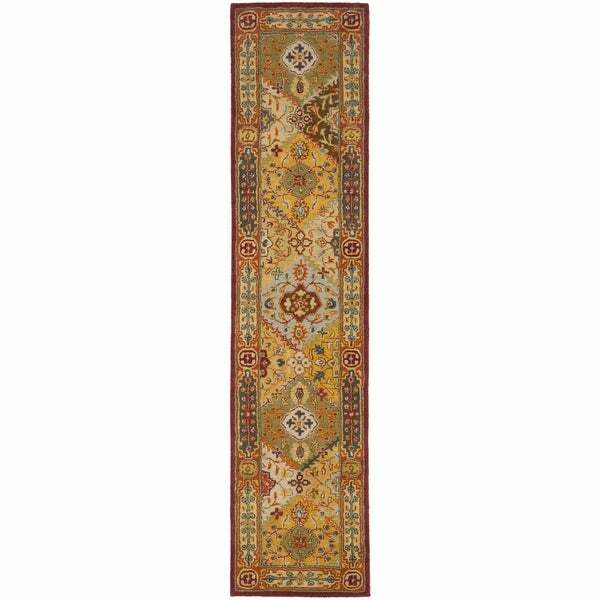 Add an exotic accent to your home or office with this Safavieh Bakhtiari wool runner. Create warmth and texture in a narrow space, such as a hallway or entry, with the intricate, multicolored Oriental design featuring hues of red, gold, blue, sage and olive. Constructed of pure wool for durability, beauty and strength, this handmade rug is latex free, making it a wonderful choice for families with latex sensitivities. Enjoy the softness and warmth provided by the thick 0.625-inch pile, which cushions footsteps and protects hardwood floors from damage, even in corridors with heavy traffic. Dimensions 2 ft. 3 in. x 16 ft. This is a wonderful colorful runner - I have it in an upstairs hallway - it has so many colors it could just about go with anything! It is beautiful and I actually ordered the small 2 x 3 for another space too. I've had this rug for years now in my main entry hall, where it gets a ton of traffic. it has held up through that, my dog's puppyhood, and my son's first 3 years. the colors are just as pictured, though perhaps a little less yellow. warm and beautiful. I have purchased other rugs in this pattern from this manufacturer in the past. I really love how versatile they are with the colors in the rugs. When we removed the wall to wall carpeting in our upper long hall there was no doubt I would purchase one of these rugs to match the smaller one in the lower hall. I was very disappointed when the new rug came as the colors were very different from my previous purchases. The old rug has soft muted colors; the new one is much brighter and the orange is a bright coral! For the car enthusiasts out there, think of the coral color on a Ford Crown Victoria from the mid 1950's! I know that over time rugs will fade, but given the fact that this hallway has no direct sunlight fading is minimal in my lower hall and on the 3 other rugs in my home. The two rugs are separated by 2 steps, and the color difference is very noticeable. We are hosting a wedding in 4 weeks so there is no time for returns. I will just put up with it for now, but I am not sure I will keep it. Other than the color, these are excellent wool rugs, easy to clean and soft on the feet. Wow, I am speechless at how lovely this rug is. I'd been looking for a LONG runner to protect the floors from the dogs, and this could not be more perfect. Very thick and lush, and the muted natural colors are absolutely beautiful. Our décor is northwest/southwest/lodge-ish with wood and natural slate floors, and I have looked long and hard to find the perfect rugs to coordinate with our Native American art and kilim rugs. This does it for sure, even better than I hoped for. Colors are rust, sage green, dusty blue, deep turquoise, and a deep burgundy red. The pattern is not super refined and detailed like a hand knotted Persian rug, but that isn't what I was going for--it has just the right level of rustic detail, much the same feel as the kilim rugs we have. I can't comment yet on shedding or wear characteristics, but at the price, I honestly don't care. I love to have beautiful pieces that don't cost a fortune since I have 4 dogs and I simply do not want to have to fret about them every minute. Love it, use it to death--it is BEAUTIFUL and I will enjoy this as long as I can. I am ordering at least two other coordinating pieces for adjacent areas. I love my new wool rug runner! I have a very long hallway, and it fits perfectly. The colors of the wool rug are exactly as pictured on your site. Every time I walk down the hall or come out of a room , I smile because my feet are happy and my eyes enjoy the pattern of the rug. My cat loves it also! I am so pleased with this rug! It's VERY hard to find longer runners, so I felt I didn't have many options. I was anxious when the package arrived (in just 3 days with standard shipping:-), but as soon as I started to unroll it, I was giddy with delight. The colors are a touch milder in person, but that works very well for my kitchen. I'd say the color most different is the red. It's a little softer and less brick-colored). I have had it for almost a month and it is hardly shedding. I haven't found a non-skid product for the carpet yet. It's only a problem when the cat and dogs are playing the size keeps it pretty much in place. I've been an O shopper for almost 10 years, and this goes in my Top 5! I love this rug. I love the traditional design but vibrant color scheme. My house is rather colorful and this rug helps pull it all together. It is a super thick rug and looks expensive. It's very obvious in the photo, but for some reason I was not expecting the redish border. The yellow is bright and charming. I highly recommend this rug. We have ours in the hall and needed some thing that would be 16-18 feet long. Overstock was a perfect place to buy! This rug is thicker and more plush than I expected - the look and feel of a much more expensive carpet. Best of all, for me, is the fact that the colors are more muted than what the picture on the computer screen showed - just like many of the reviews said when I ordered it. I was a little nervous, as my colors are more in the earth tone range in my house. The red is more of a rusty, soft red, and the little bit of blue is also a grayish blue and not prominent. My room is mainly olive greens and browns, which this rug has plenty of, and now I can bring in a deep reddish rust color with accent pillows. I also like the way the carpet has a vintage look, but not overly so. All in all, a perfect rug in a hard to find category: extra long runners. It is heavy and stays put on my shag carpet. very heavy rug, sheds for a while but all in all I am happy with the size and color. I wasn't sure about the colors of this rug. It is so hard to tell from a computer screen, but I am very happy. It goes great in my home. The rug has the following colors: sage green, forest green, olive green, burgundy (not red), rusty orange, grayish/blue, and brown beige. I thought there was navy from the picture, but no navy. Just nice, natural earth tones. It will go with a lot of natural color schemes. It is very heavy, and nice quality for the price. Nice runner. Had it since 2010 & still in good condition & color still nice and still soft. Very pretty! Sheds a lot! This was well worth the money, & was actually surprised at how Luxurious it was for the price! I’ve seen other’s this size over $500 dollars! Very Happy with this purchase! Perfect runner for our long hallway - so glad it's one piece instead of two smaller ones! Thick and plush rug. Just what we were looking for. High quality carpet with color and lint issues. This is a thick, good quality rug BUT the colors on site are not even close so I am glad I didn't order the large area carpet to "match". Others have said their colors were brighter; mine were drab, muted. The photo online was golden (although I expected red somewhere because it's described as a multi/red runner) but this has a strong red border with drab green/blue/beige patterns throughout. The other issue is the lint. Quarts and quarts of lint as measured from my Dyson. The fuzz packed my Roomba in no time, so I switched but it will take a long time of Dyson vacuuming to stop filling the Roomba. In the meantime, my Roomba can't get passed the hallway because it senses dirt. There was also a lot of dusty silt in the Dyson each time I emptied it. However, it is a lovely, plush carpet at a steal and the only runner I could find for 16/17 feet. I just wish I could match it in a nearby room! It looks lovely and may match my floors and furniture. "Is there a large area rug that coordinates with this runner? Something like 8 x 12?" Actually, there are a number of sizes in this particular rug. Search the title of the name in the search bar without putting in a size and they should all pull up.